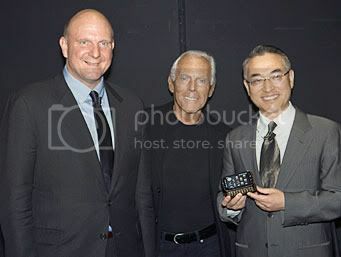 Microsoft CEO Steve Ballmer, Giorgio Armani and Won Pyo Hong, executive vice president at Samsung Mobile, display Samsung’s new Armani phone powered by Windows Mobile 6.5 during a joint press release in Milan, Italy. On October 6 Microsoft unveiled a new generation of Windows phones from leading manufacturers and mobile operators that offer an intuitive user interface, powerful Web browsing, and access to an online library of downloadable services and applications. This stylish new phone from Samsung, powered by Windows Mobile 6.5, was unveiled by Giorgio Armani, Microsoft CEO Steve Ballmer, and Won Pyo Hong of Samsung Mobile.